Chemical Peels are at times necessary and least invasive to correct, maintain and restore the skin. Exclusively available and performed by L4lexo licensed professionals the LeXo Peel is in the cutting edge of TCA peels. In addition, our Lelexo professional treatment products work in collaboration with Lelexo Home Care products to maximize skin results. Trichloroacetic acid peel or TCA peel is a medium depth chemical peel that dissolves layers of skin in a controlled procedure. Factors that affect the depth of this peel included the acid percentage, the number of layers and the amount of pressure applied. The deeper the peel is the more dramatic the results are and the longer healing time or “downtime”. >This peel will improve hyperpigmentation, reduce fine lines, smooth acne scars and refine skin texture. The post peel healing is known as “downtime”, and may need 5 to 7 days to complete this process. As a medium depth chemical peel, downtime may range from a light flaking to heavy peeling but the results are well worth it. During the treatment, gauze saturated with the TCA solution is carefully applied in multiple layers with light to medium pressure depending on the condition, type and tone of the skin. As each coat of TCA solution is applied it will continue to remove layers of skin. Redness in the treated area is common and may “blanch or frost”, which is a temporary opaque whitening of the skin. With the penetration of solution, a sting or hot sensation will be experienced but this will subside by the end of the treatment. A hand held fan may be provided to cool the skin and help relieve discomfort. 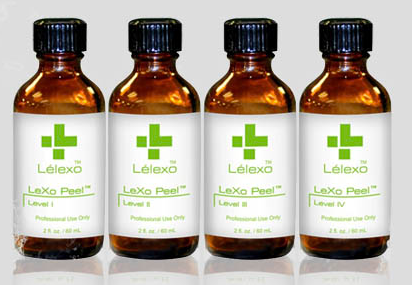 LeXo Peel is a unbuffered self-neutralizing chemical peel consisting of Lactic Acid, Citric Acid, Salicylic Acid and TCA. Specifically designed in a 4 bottle delivery system, each bottle consisting of a different percentage can effectively treat several conditions such as fine lines, wrinkles, acne, acne scarring and hyperpigmentation. LeXo Peel is also formulated to treat all skin tones.